In the centre of Bali is Padma Resort Ubud, which is a stunning luxury hotel surrounded by lush forestry. The resort makes for a perfect retreat in Bali and would suit anybody needing to get away, or just have a wonderful relaxing time. Although I would recommend the hotel to just about anyone, I would highly recommend couples and newlyweds, due to the resort feeling a bit isolated and away from everything. The hotel is built on 11 hectares of land in the Payangan province with hills and forestry all around. 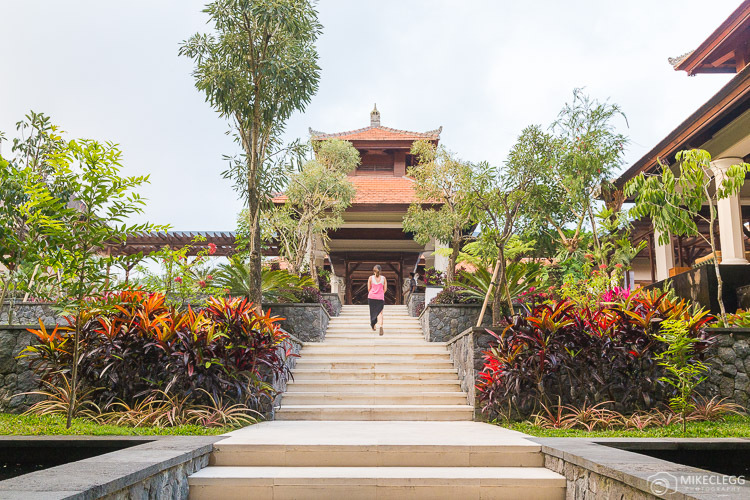 What really impressed me about Padma Ubud is that every detail has been carefully designed in the hotel, encompassing stunning decor and Balinese details throughout. 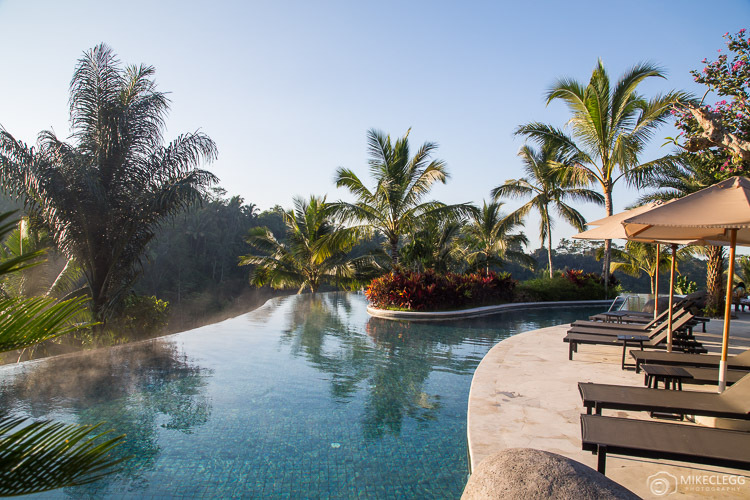 From the rooms, the pool, the gardens, everything is designed to perfection. 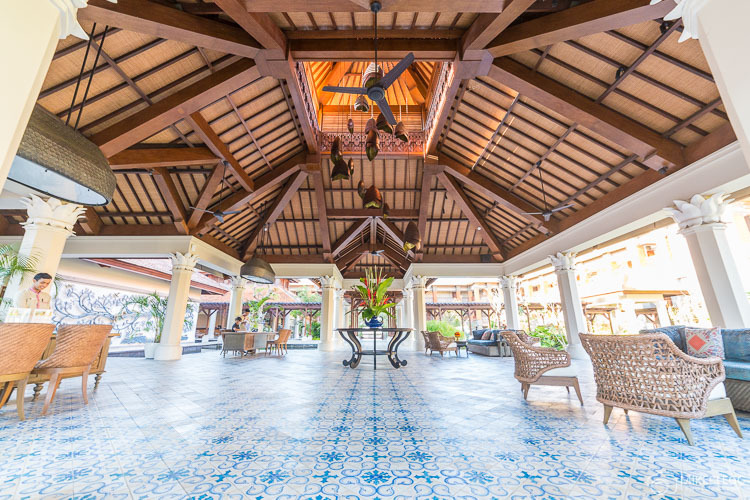 As you arrive the first thing you will see is the grand lobby seen below. And as you wait briefly to be checked-in, the porters will bring you a delicious welcome drink. Whilst sipping your drink you will then enjoy the site of beautiful Koi fish swimming in the water features that surround the lobby. 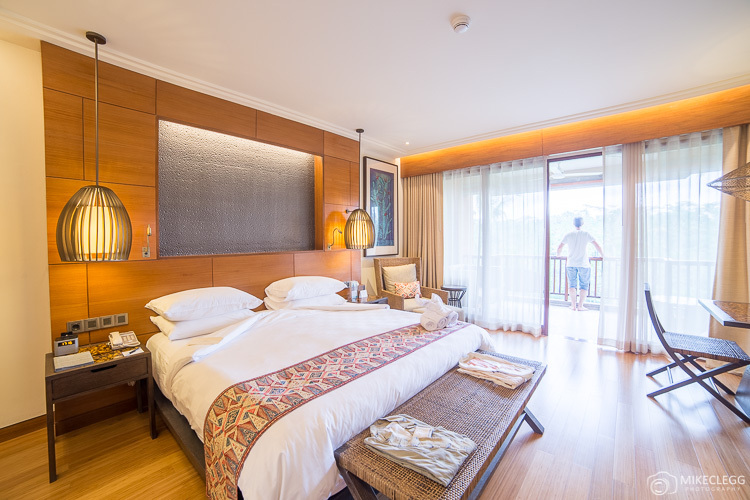 Padma Ubud has 149 guest rooms which include 6 suites. A standard room starts at US$324 (Premier Room). Suites start from US$566 for a one bedroom suite or US$791 for a two bedroom suite. The rooms all come with bed and breakfast, but when booking you may find deals on the website where afternoon tea and the main meal is included. I stayed in a Premier Room during my visit and I was really impressed by the design and size. The room was huge and felt so comfortable with beautiful stylish furnishings. Within the room was a large adjoining bathroom, which can be open to the bedroom or closed off using sliding doors. There is also a large walk-in style closest with plenty of space to hang your clothes. For those wanting to relax and enjoy views of the forest, you have an attached balcony. Bathroom – The bathroom was spacious and had both a bathtub, shower, sink and large mirror. Within the room, you get provided with various toiletries and lots of towels. Mini Bar – The room comes with a fridge, but if you would like a mini bar setup then you request this prior to arrival, or at the reception. The hotel offers Mini bar packages starting from IDR 275,000, which can include a can of Bintang, soft drinks and various snacks such as chocolate and crisps. If you would like champagne, wine, or any other drinks, you can order on the menu provided and the hotel’s team will bring these up. A’la carte breakfast in the Club Lounge, or the buffet selection. Tea, coffee, soft drinks, juices and small snacks in the Padma Club Lounge between 11:00-23:00. Afternoon tea with snacks and ice cream between 14:30-16:00. Evening cocktails which also includes beer, house wine, spirits, cocktails and non-alcoholic drinks as well as canapés. This is between 16:30-18:30. Complimentary mini bar consisting of two cans of beer and two bottles of juice. One-time laundry service per stay for up to 5 pieces per room. No dry cleaning. 15% discount on dinner at The Puhu Restaurant. 20% discount on most treatments at the Spa. I had a brief look at some of the other rooms during my stay, and below you can see some pictures of one of the suites. 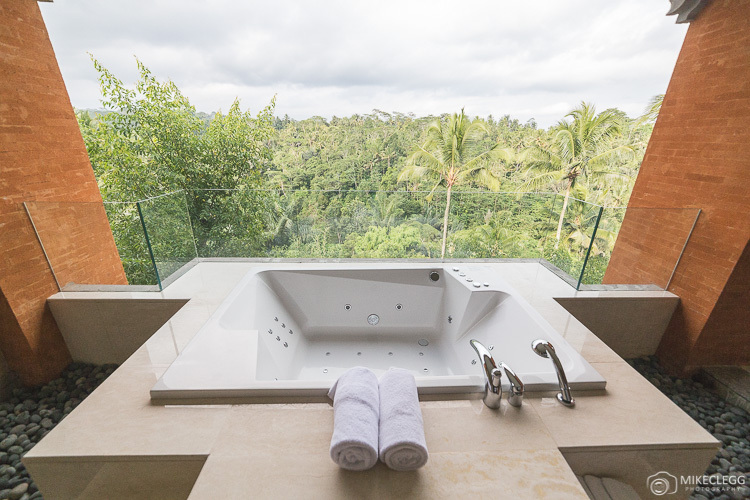 The suite I saw even had an outdoor whirlpool bathtub overlooking the forest. 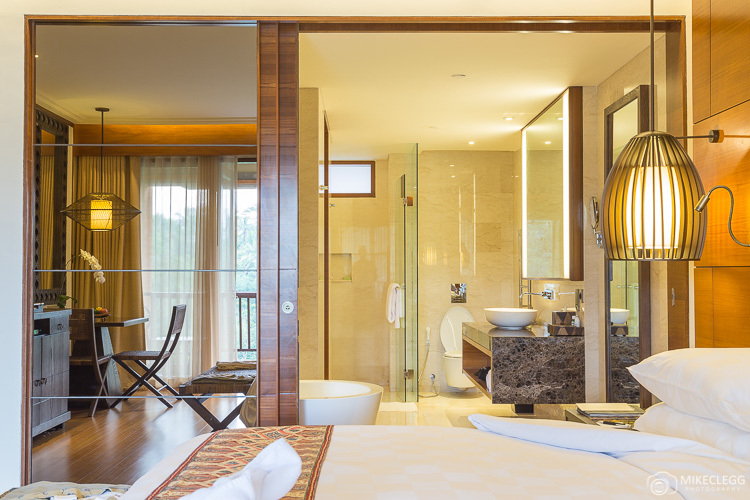 Padma Ubud hotel has a range of facilities from an outdoor pool, whirlpool, fitness gym, spa, kids club and more. 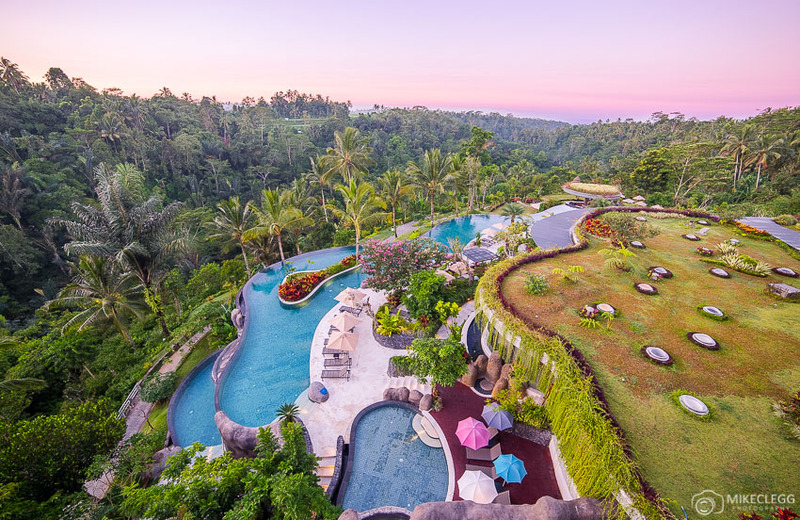 The hotel has a stunning infinity pool, which is one of the longest pools in Ubud as well as a smaller pool for children, and a whirlpool. With views of the jungle, a great snack bar and comfy sunbeds, the pool is the perfect place to spend your day soaking up the sun. Below you can see a small section of the pool. Have a look at the first photo on this post to see just how big the pool is. Swim Up Bar and Fire Pit – The hotel even has a swim up bar, allowing you to get refreshments such cocktails, mocktails, beer, spirits and soft drinks without even leaving the pool. 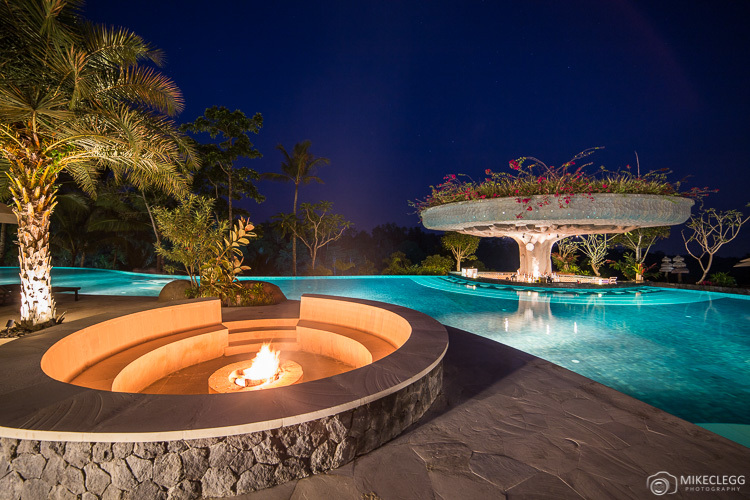 And at night there is a fire pit to lounge around seen below. 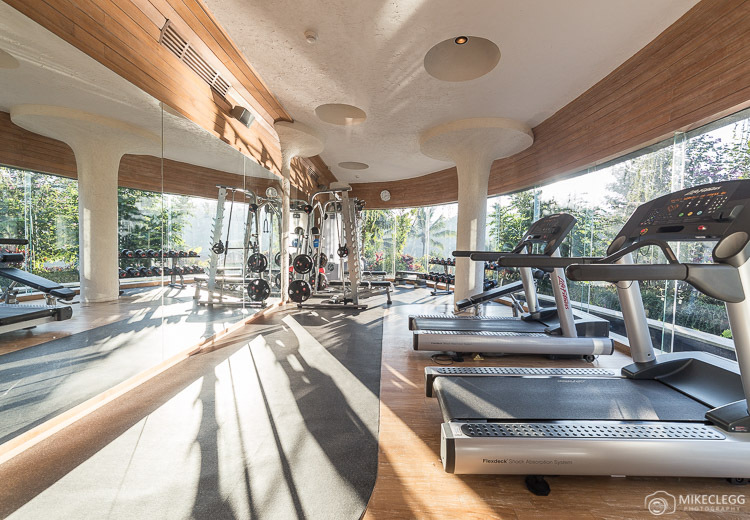 The gym is a brightly lit workout space, providing jungle and pool views whilst you exercise. Within the gym is a good amount of equipment such as treadmills, free weights and exercise machines helping you stay fit while you travel. 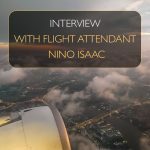 To read more about travel and fitness head to Travel Tips: How to Stay Fit Whilst Travelling. For those wanting a treat then head to the beautiful spa. The spa offers a range of treatments for one or two persons. 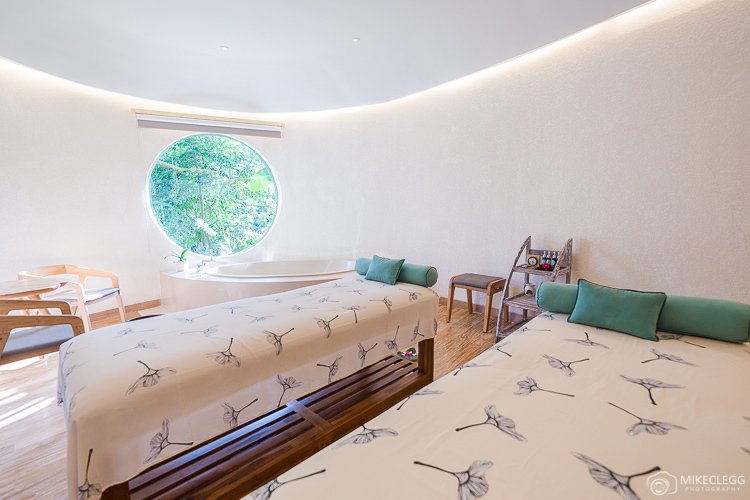 Some of the options available include massages, scrubs, as well as nails, face and two-person treatments. Head to www.padmaresortubud.com/facilities/spa to view the online menu and treatments available. 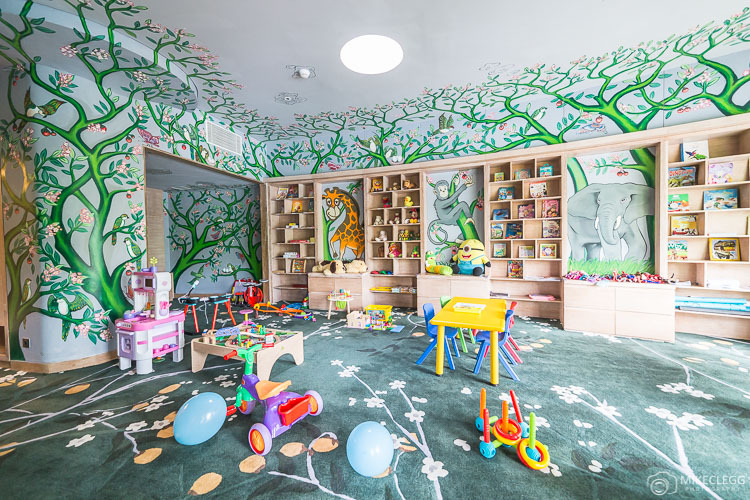 For children, there is a very large play area full of toys and has been designed with great decoration representing the jungle and location of the hotel. I loved this room and if I was a kid I feel I’d definitely want to play here. As well as the play area Padma Resort Ubud provides daily activities for children. You’ll find these below. 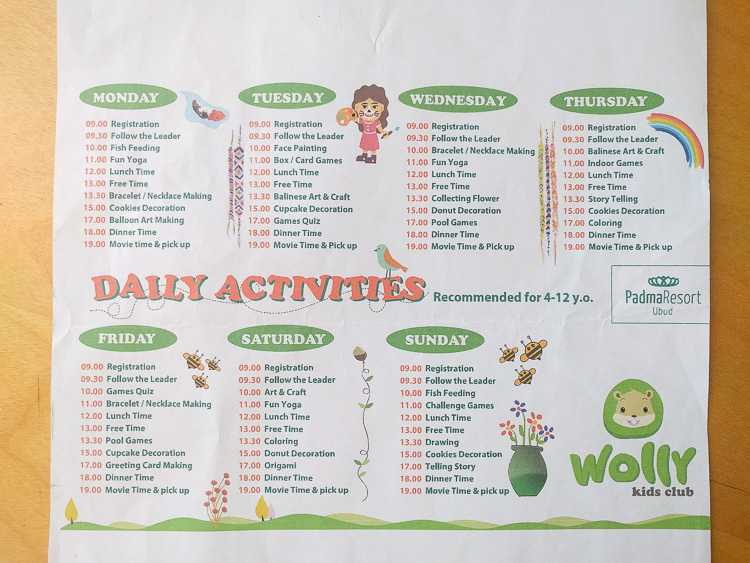 Here are some of the activities that were available in the kids club. 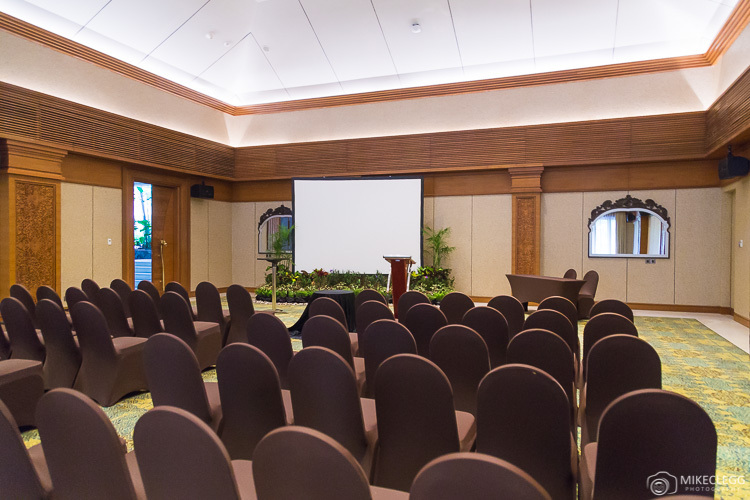 Padma Ubud has various rooms available that can cater for weddings, meetings, conferences and other special events. Below is one of the rooms that can be hired. 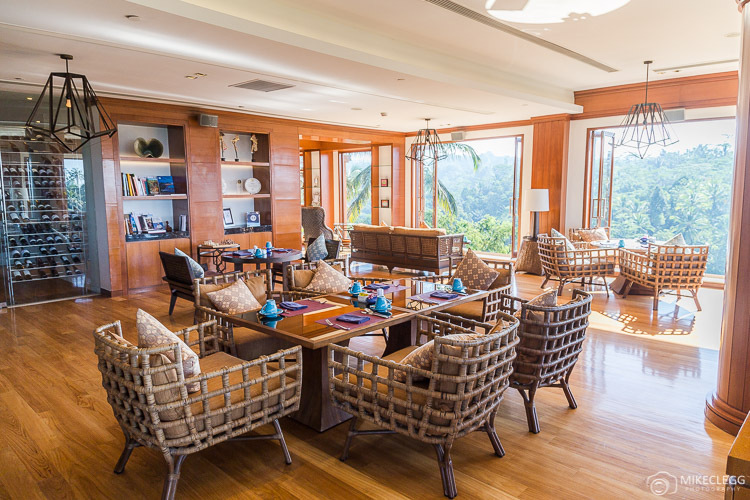 The food throughout the hotel is delicious, and you can choose to eat at the pool bar or the main restaurant on the top floor that overlooks the jungle. The menus have a variety of food from local Indonesia and Bali style dishes, as well as more western food such as pizzas. The breakfast is on the top floor/restaurant giving you wonderful views across the pool, roof garden and forest with the beautiful morning light. As you walk in you will enjoy some typical Balinese Rindik music. For club members, you have the added benefit of à la carte in the club lounge if you prefer. 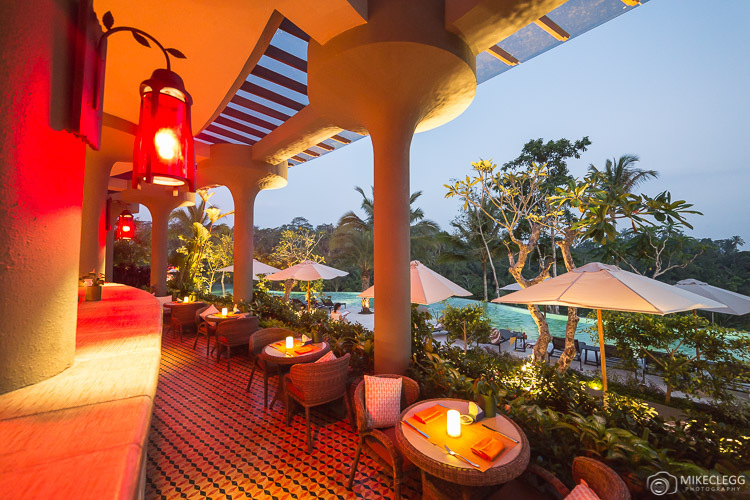 For a wonderful romantic dinner, Padma offers a special package for couples This would be either by the pool or at Bale Bamboo which is a bit more isolated. You would then get a delicious menu prepared by the team. Head to padmaresortubud.com/dining/romantic-dinner to find out more. 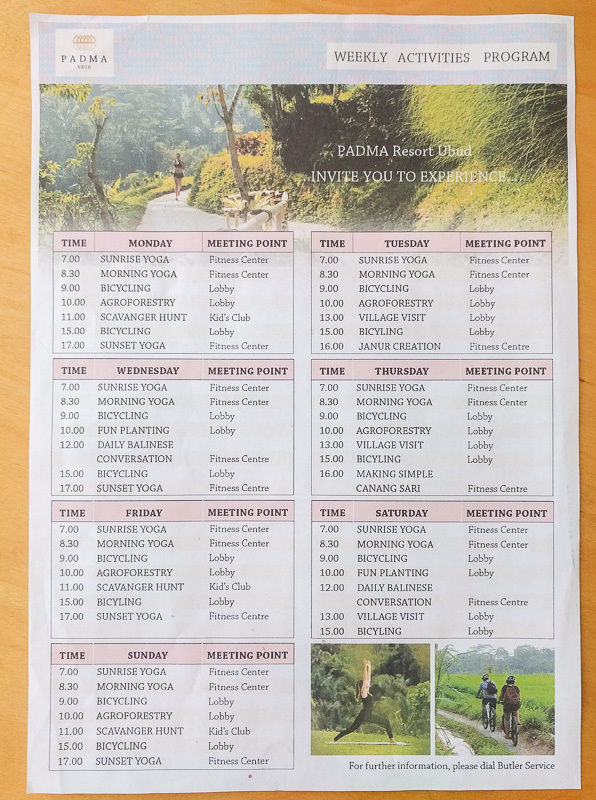 Padma Ubud offers different activities each day, from sunrise yoga, bicycling, Balinese conversation, scavengers hunts and more. During my stay, I joined the bicycling and my partner joined the yoga. The bicycling activity involves going on a guided bike ride and there were options for both beginners (3k) or intermediates (5k) around the local area. 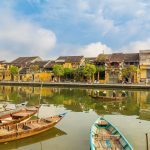 During the bike ride, you would see rice paddies, local streets, houses and temples. The hotel provides bikes, helmets, water and there’s also a safety briefing. On the tour, you will also stop at various points to take pictures, and the guide will explain what you see, and a few things related to Balinese culture. I found this activity very enjoyable and on the intermediate, it was slightly tough at points (as I hadn’t cycled for a while), but it was easy enough and I loved the scenery. 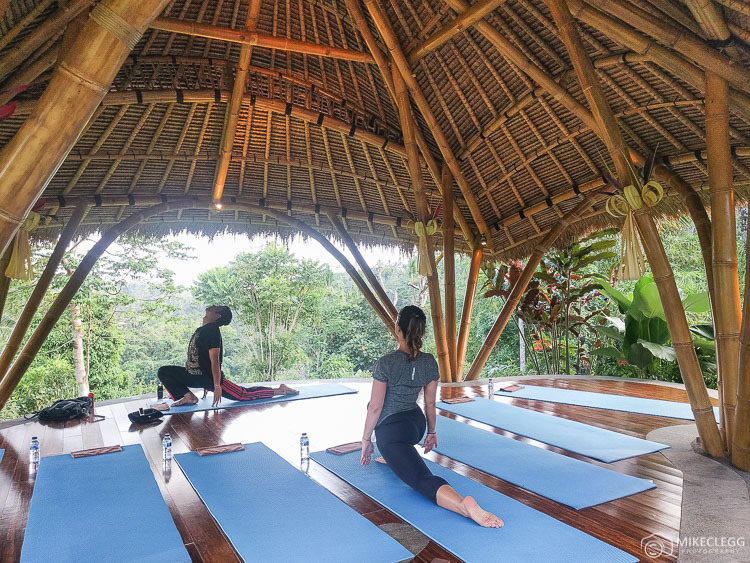 Due to the location, Padma Resort Ubud makes for a perfect place to practice Yoga. The yoga location is slightly down from the hotel close to the forest and is extremely calm and peaceful. Throughout the week there are sunrise, morning and sunset yoga practices. 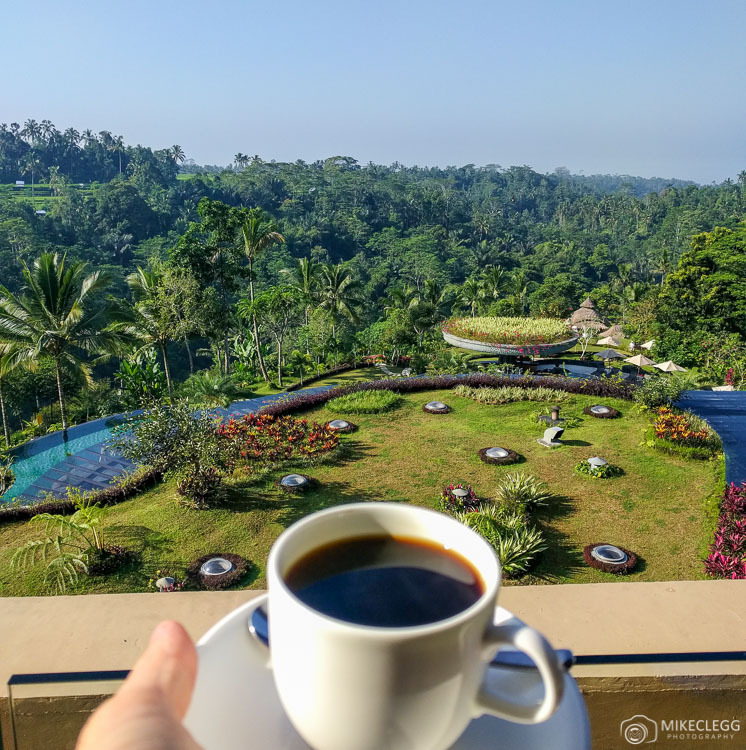 WiFi – The WiFi at Padma Ubud was absolutely incredible, and it felt like wherever you were in the grounds of the hotel you would be connected. Even along the road that leads up to the hotel from the main street, which is nowhere near the main building. I also found I was connected quite low down in the gardens towards the Yoga area. And it wasn’t just slightly connected either, I had a fast and reliable connection! This is something I highly praise the hotel on getting so perfect! Transfers – For a two-night stay guests would receive complimentary pickup from the airport to the hotel! If you are staying for 3 or more nights you will get a return pickup from and to the airport. As the hotel is quite far from the airport and it’s also so beautiful, I would recommend staying for as long as possible to get these complimentary pickups. The hotel can assist with other transfer options for additional charges. Parking – If you are driving then Padma provides complimentary parking for guests. High and Low Season – For those curious, the low season in Bali starts mid-January until April. The high season starts in May until mid-November, and the peak season is December until early January. 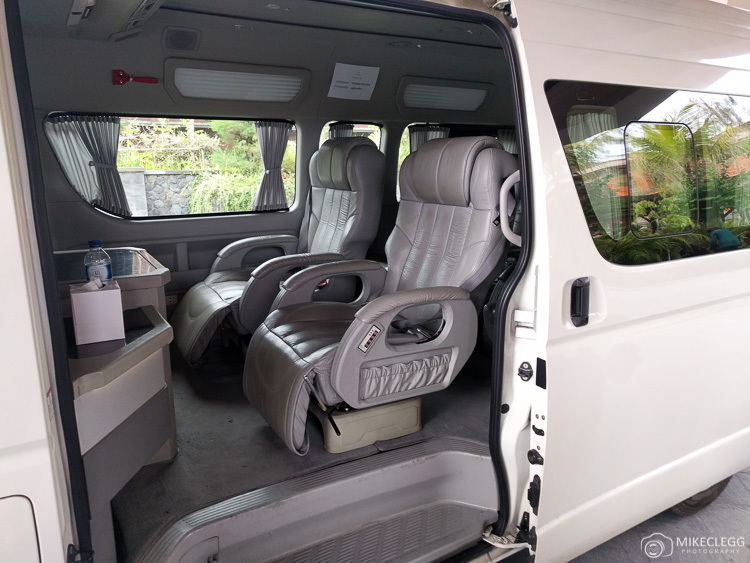 Shuttle Bus – The hotel has a complimentary shuttle bus that takes guests to Ubud Centre several times throughout the day. The bus goes to the Centre at 0900, 1200, 1500, 1700 and 1900. There is a return shuttle bus back to the hotel at 11.00, 14.00, 16.00, 18.00 and 21.00. You should register if you wish to be on the bus, otherwise, it can get full. The bus also includes WiFi and there are even some charging sockets available. 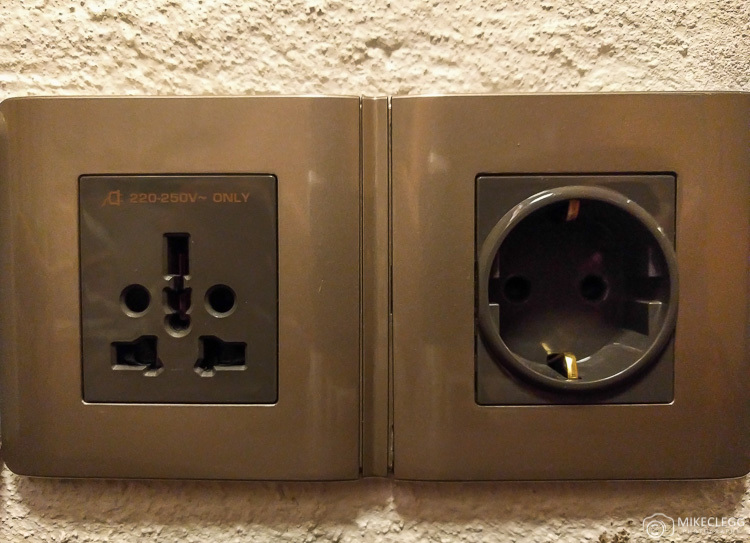 Plug sockets – The hotel provides international input plug sockets which would cater to customers from all around the world! The inputs took devices of 220-250v, so if you are coming from a country with a lower voltage make sure you have a converter. 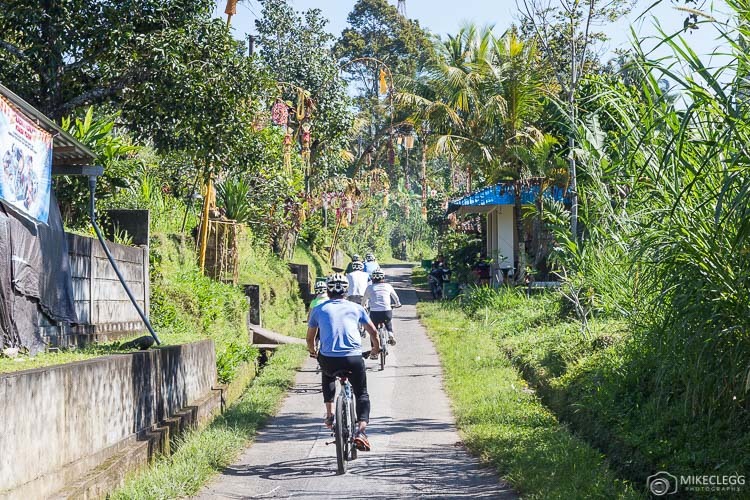 Some of the things to do nearby include heading to Ubud Town and visiting the famous monkey temple. 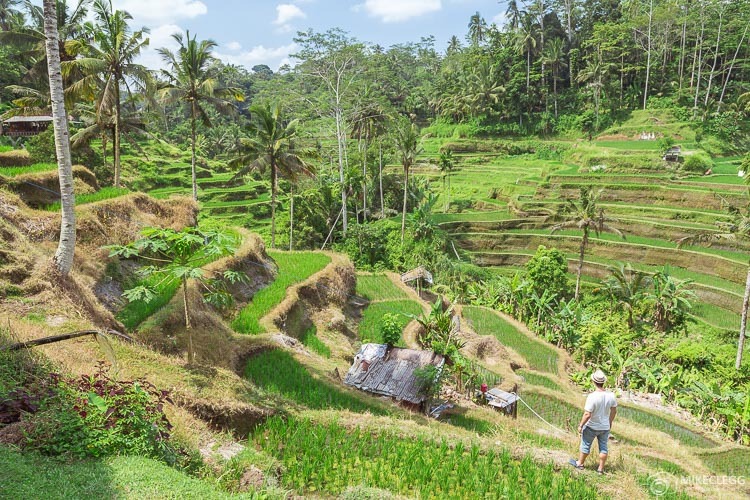 As well as this you could visit the Tegalalang Rice Terrace rice terraces which are one of Ubud’s highlights. When staying at the hotel ask the concierge for assistance and suggestions on things to do. I felt Padma Resort Ubud was simply fantastic. Although I only stayed for two days I would happily have stayed for a whole week. I loved swimming and lounging around the pool, and really enjoyed the tasty food at the restaurants. I thought the activities the hotel offered, especially the cycling and yoga were perfect for guests and really suited the destination. Disclosure: I was hosted as a guest at Padma Resort Ubud. All comments, words and opinions truly reflect my personal opinion. 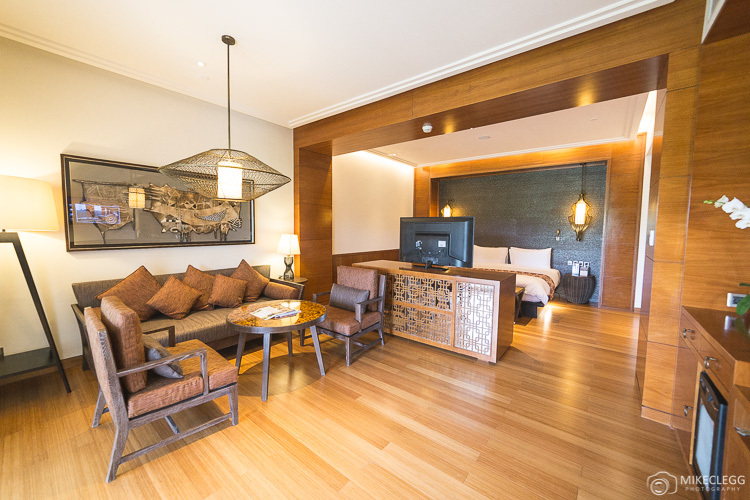 Hey Buddy!, I found this information for you: "Exotic Retreats at Padma Resort Ubud in Bali". 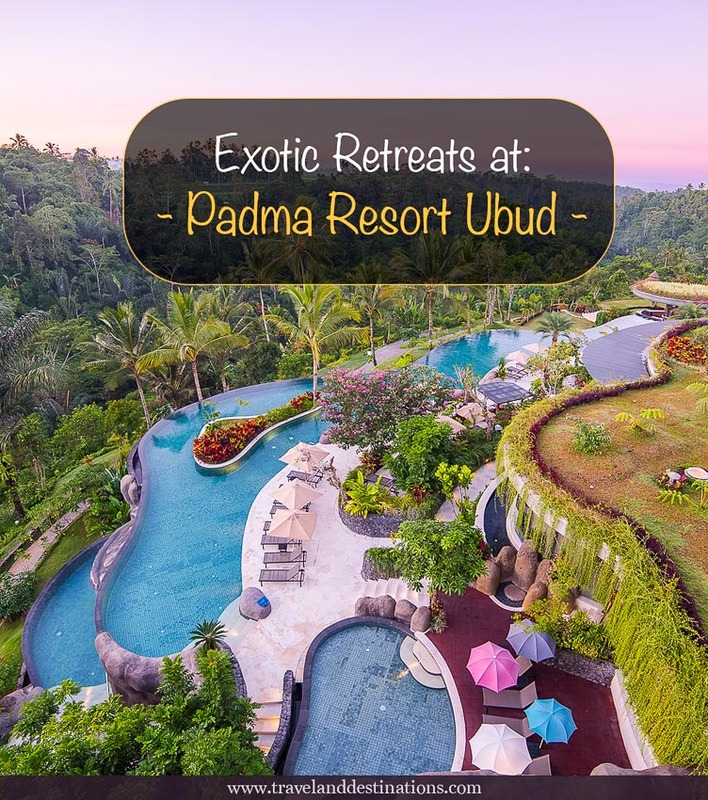 Here is the website link: https://www.travelanddestinations.com/exotic-retreats-ubud-padma-resort-bali/. Thank you.